Let’s make a confession. We never feel bored of hummus no matter how much we eat. It’s such an amazing dip that we never want to get our head out of it! We want to dig in deeper right after tasting it. We have such a big love of hummus that we can have it in any version. This is the first time we tried Roasted Red Pepper Hummus and we seriously fell in love with it! We already have a favorite hummus recipe; the classic hummus in Turkish cuisine, which is topped with red pepper sauce, sumac and parsley. 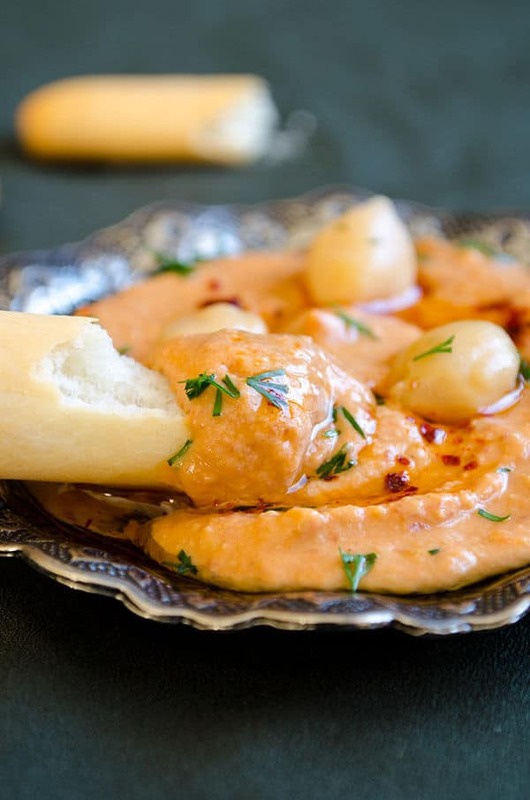 I must proudly say that this roasted red pepper hummus has already become our second favorite! Roasted red pepper matches very well with the oily flavor of tahini. I think it balanced the flavors perfectly! Are you one of those who love hummus without tahini? Well, we can’t think of it without that oily ingredient, besides garlic and lemon juice, tahini gives the taste of hummus, doesn’t it? I know it’s not a low-calorie food, but you can reduce the amount if you like. Don’t you think roasted red pepper hummus has a very nice color too? It looks like a completely different dip with that reddish color. Normally I love making things from scratch, but sometimes I don’t have enough time for it. I made this hummus on such a no-time-for-basic steps day and had to use store bought roasted red pepper and canned chickpeas. Am I supposed to feel guilty? I don’t think so. Life is sof ast and we need to keep pace with it, right? Some recipes recommend removing the skin of chickpeas, but I think it’s waste of time and not really necessary. I’ve tried it before and noticed no difference in taste. No need to make a simple recipe harder, so leave them as they are. Pour tahini, garlic and lemon juice in a food processor and process until they are combined. Add in chickpeas and roasted red peppers and process until smooth. You can add extra chickpeas if you desire it thicker. Garnish with whole chickpeas, fresh dill and red pepper flakes.